Forgive my profound sadness as I mourn the end of Cake Season 2009 for our family. I won't enjoy the sweet perfection of another cake until my daughter's birthday in December. My figure-conscious mother's August birthday doesn't count, because she only celebrates the occasion with a decadent (for her) treat of two pecans and a spoonful of whole milk. At least today's cake, in honor of my son's sixth year on this Earth, was as delicious as it was beautiful. It is a small miracle that this cake turned out so well, however- we just didn't realize it until the cake was actually sitting on our kitchen counter. If you've ever browsed a catalog of cakes at a bakery, what you likely saw were ads for various "cake kits," which bakers use to produce themed cakes featuring all manner of licensed properties, from Barbie to Winnie the Pooh. The kits basically consist of a handful of accessories and a photograph of the finished cake. It is up to your bakery to provide all the edible portions of the cake in that photo. 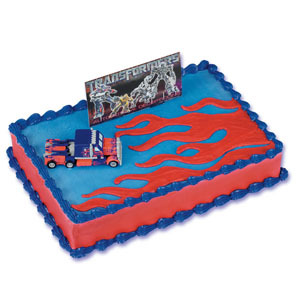 Well, this year, our son wanted a Transformers cake, and he knew such a cake existed because he and I had once spotted the below design at the bakery of the grocery store up the street. Given that there have been two blockbuster films based on Transformers in recent years, and they've released new toys alongside the films, one would assume there would be a variety of Transformers cakes to choose from, but until just recently there was only the one kit. The kit's contents? One toy, one cardboard backdrop. Period. Now, the flames do look pretty badass, but it's otherwise kind of a chintzy design when compared to the unmitigated awesomeness of the Pirate Ship 3D Super Sized Cake. (Guess what I be havin' for my next birthday, maytee...) I could be selling the Transformers kit short, I guess; after all the purple stool that kids experience the next day might be a delighter that proves this cake to be more of a grower than a shower. There's just one problem, though- no one seems to know how to replicate those goddamn flames. 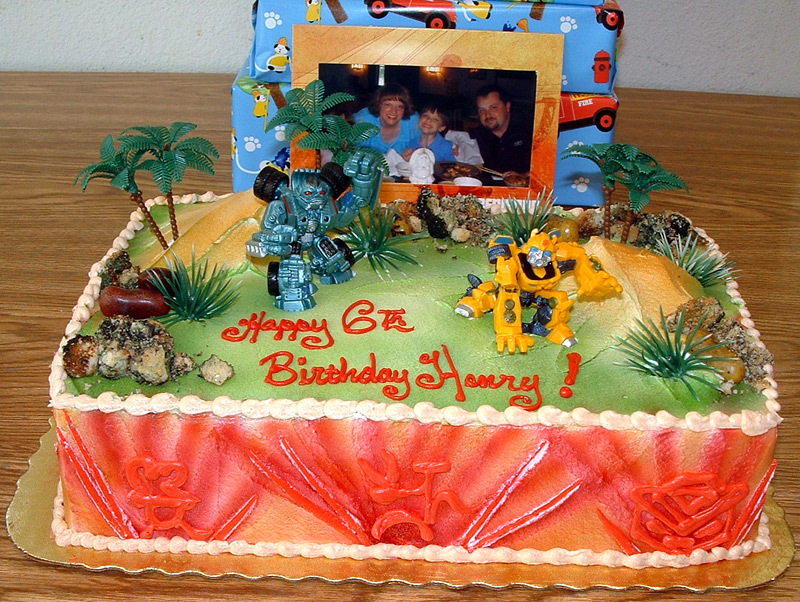 Every once in a while I pop over to the Cake Wrecks blog to facepalm at the complete ineptitude of cake decorators around the world, and there just happened to be a recent article there on Transformers cakes. 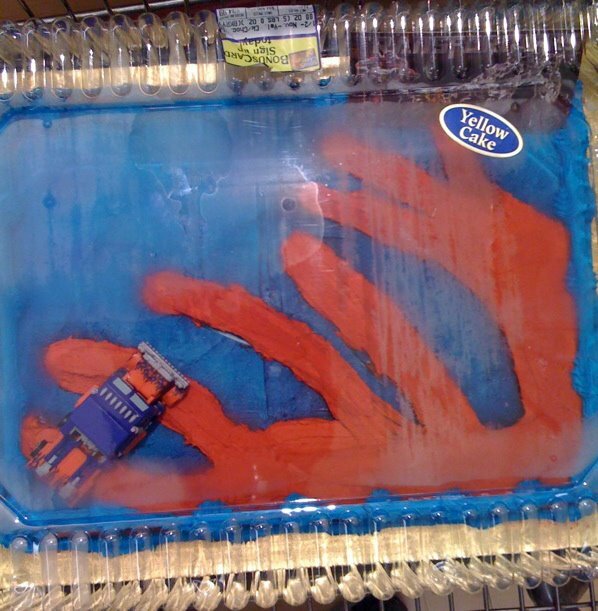 There was the picture of the kit I had seen before... and then there were the jaw-droppingly bad attempts by various bakeries to replicate the cake in the photo. 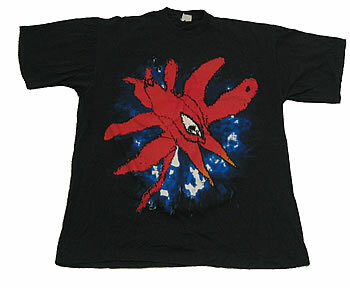 Below is just one example (see the article for more). I wonder if the decorator was a Cure fan?